I am fascinated by waste. I have always been intrigued by our society’s relationship to various forms of waste—food waste, plastic waste, textile waste, toxic waste, technological waste, even human waste! It is omnipresent, inescapable, and pervades nearly every aspect of daily life, yet it's also intentionally hidden, stigmatized, feared, and avoided. Entire industries exist to sort, manage, process, ship, bury, burn, reuse, and upcycle our waste. The scale of our country’s trash is incomprehensible. And its impact on our climate is truly reprehensible. As someone who aims to live a trash-light lifestyle, I am always thinking about what I am consuming and what waste I am producing. In high school when I started getting into the environmental movement, I went through my trash after a week and inventoried it, shocked by what I discovered. I developed solutions to each of my “trash problems” and found it so satisfying to implement them in my daily life, despite the often strange looks I would get from onlookers. Inspired by my neighbor and zero-waste pioneer Bea Johnson, I began changing my ways to produce as little trash as I could. As a result, I felt a heightened sense of integrity and intentionality over my consumption. I felt less environmental anxiety and instead, more accountability and ownership over my choices because I was able to control (most of) the waste I produced. Motivated to share my findings with others, I decided to start making artwork about trash. This piece is called Seven Days. For Seven Days, I asked four of my friends to collect all their trash and recycling for a week. I then took a portrait of them lying in it. For the exhibition of this series, I printed the portraits as largely as I could and instead of mounting, framing, or hanging them, I put them as is on the ground of the gallery in which they were exhibited. Behind each printed portrait sat a large pile of my subject’s trash. 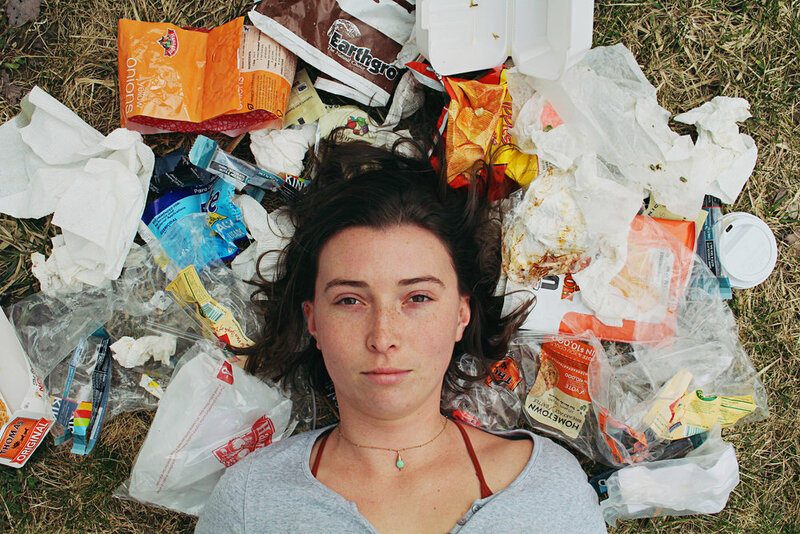 This series is about confronting the waste we produce every day. It is about getting intimate with what we throw away in order to remember that there is no “away.” Rather, all of our trash goes somewhere—the landfill, the ocean, the atmosphere, overseas… In this case, each subject’s personal trash pile sat in a clean gallery space, forcing viewers to literally walk around it, smell it, and touch it. Call me crazy, but I enjoyed going through each person’s trash; I felt intimately connected to them. Beneath sticky smelly food wrappers there were ticket stubs, tissues, tampons, Sticky notes, letters, cat food containers, and even hair trimmings. 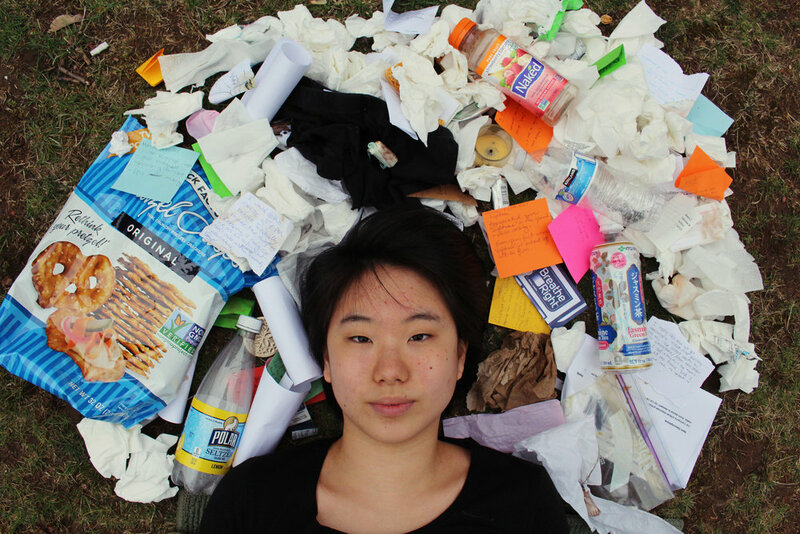 Each subject’s trash is not only a personal history of their week, but also a record of their consumption patterns. Their trash reveals aspects of their identity: their consumption habits, food preferences, shopping choices, behavior, and even relationships with others. I often wondered, if I were to take the person out of the image and leave the pile of trash remaining, who would the viewer think produced that pile of trash? This series will perhaps make viewers confront their stereotypes about identity based on what they learn from each pile. My hope is that this work inspires people to think more deliberately about their consumption and the trash they create, hopefully finding ways to generate less waste. LOAM REAWAKENING RESILIENCE IS LIVE!